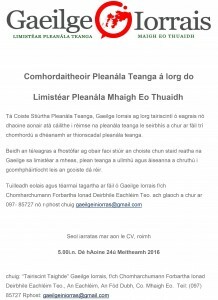 Tá Coiste Stiúrtha Pleanála Teanga, Gaeilge Iorrais ag lorg tairiscintí ó eagrais nó dhaoine aonair atá cáilithe i réimse na pleanála teanga le seirbhís a chur ar fáil trí chomhordú a dhéanamh ar thionscadal pleanála teanga. Beidh an té/eagras a fhostófar ag obair faoi stiúir an choiste chun staid reatha na Gaeilge sa limistéar a mheas, plean teanga a ullmhú agus áiseanna a chruthú i gcomhpháirtíocht leis an gcoiste dá réir. This entry was posted in Community, Eachléim Notes, News, Training / Classes by Bainisteoir CFID. Bookmark the permalink.